Ready for a Roarin' Cinco de Lions? 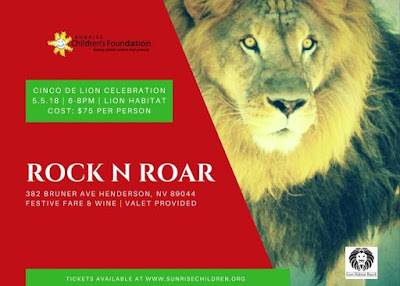 An upcoming family event, the Rock N Roar celebration on Saturday will be May 5th, from 6:00 – 8:00 pm at non-profit, Lion Habitat Ranch! Proceeds will benefit Sunrise Children’s Foundation and their efforts to support the HIPPY Program’s (Home Instruction for Parents of Preschool Youngsters) School Ready Initiative. There will be live music, themed Mexican dishes and spirits, including margaritas!